I, Santhosh and my wife Kavya, parted with our first daughter Deepti (who is currently with an NGO) to Dandy Walker's Syndrome. We were soon blessed with a second daughter Sana, who had been a healthy baby initially, untill she was diagnosed with Pre High-risk Infant ALL (Leukaemia (Blood Cancer)). She underwent constant treatment and chemotherapy for 8 long months at Kidwai. 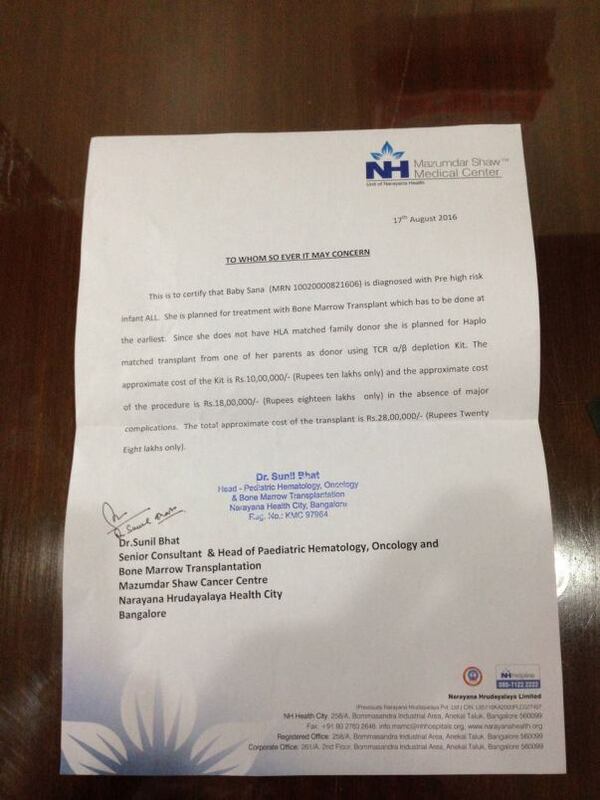 She is now to undergo a BMT at Narayana Health City Hospital, Bangalore, under the capable supervision of Dr. Sunil Bhatt. I work in the field of weaving, while my wife is a homemaker. The estimated cost for this treatment is 28 lakh, and we are finding it hard to put together the amount, post the previously incurred cost of treatment. I have drawn down almost all of my savings. Please help Sana make it through and lead a healthy life with us hereafter. We would like to thank you all for the contributions to provide the highest quality of care for baby Sana. Unfortunately, despite the medical team’s best efforts, Sana passed away on 26th January 2017. She was suffering from critical viral brain infection. She underwent a treatment for refractory acute lymphoblastic leukemia from 16th to 22nd November 2016. Post BMT, she developed high fever and terrible throat pain. 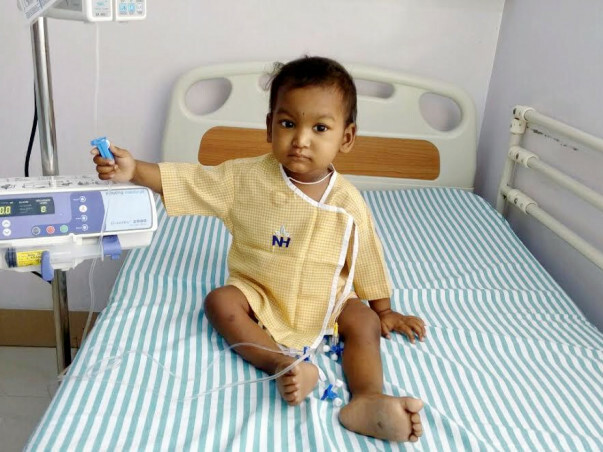 She suffered from noisy breathing which did not stop even after continuous nebulization and had to be urgently shifted to PICU. Although they put in multiple efforts, she contracted CMV reactivation which affects multiple organs of the body. On the evening of 26th January, Sana became unresponsive and had repeated cardiac arrest. Despite prolonged efforts, she succumbed at around 6pm. We once again thank the donors for their support. May her soul rest in peace. We pray the family finds strength in this time of grief. Sana’s bone-marrow transplant date has not yet been finalized unfortunately and is being pushed repeatedly due to clinical reasons. Dr Sunil Bhat has said that results from the blood tests are not favourable yet. Sana will complete a year in the world on November 27 and her parents hope that her birthday will bring some good news. Recently, Kavya and Santosh along with Sana visited Milaap’s office to meet the team and to say thanks. We would like to convey their gratitude to you -the contributors, without whom the treatment wouldn’t have been possible. I thank everyone for supporting for my daughter baby Sana to recover from blood cancer. Right now she is admitted in the hospital for chemo therapy. She underwent 6 cycles of chemotherapy and will be discharged from the hospital today. Doctor has asked us to visit the hospital next week for a follow up. 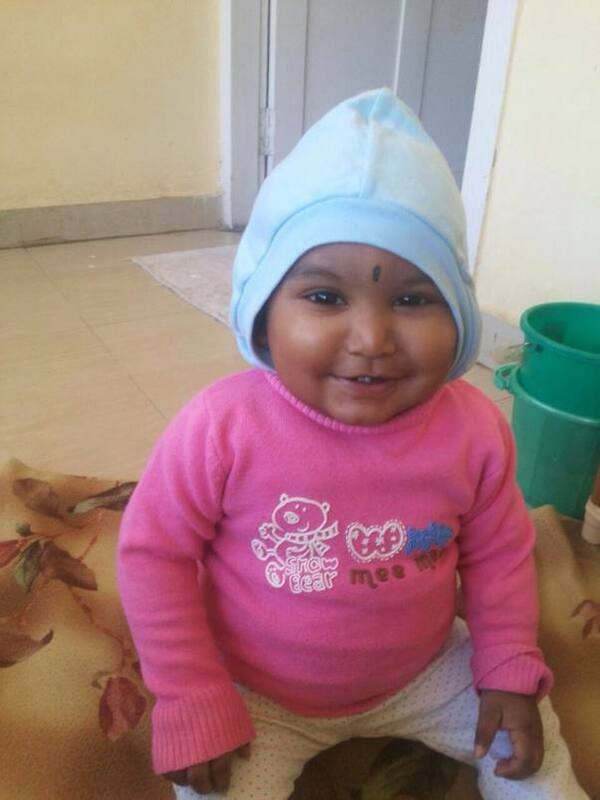 In another 15 days she is expected to undergo BMT (Bone marrow transplant) in Narayana Health city. I once again thank every one for contribution & support. I request every one to share this campaign with your friends,relatives and colleagues to support my daughter in recovering from the disease.